Since the death of Margaret Thatcher last week there has been a huge controversy and divide between those who are for and against ‘The Iron Lady’. There were a lot of people who were celebrating her death on Social Media sites, and in once case a Police Sergeant from the Met who shared his celebratory thoughts and those who should be next, resigned from his job, handing himself in to Professional Standards. The song ‘Ding Dong – the witch is dead’ made it to number 2 in the charts and the BBC then had to decide whether it was disrespectful to have it playing on the air. The cost of the funeral, estimated at 10 million pounds has also sparked serious debate. When people are struggling to eat and keep their homes, money that the country can ill afford is being spent on the controversial ex Prime Minister. Several outbursts of unrest in towns and cities up and down the country saw protesters, some of which looked at an age that they weren’t even born when she was in ‘power’, clashing with officers. Thatcher was the first female prime minister and was a strong minded woman and made some extremely controversial decisions The Falklands war was during her time in office, and comment has been made thanking her for the decisions she made to keep the Falklands under the GB wing, others who were destroyed with the closure of the mines and the changing face of our industry in this country which many argue has never recovered and of course the privatisation of many of our utility companies. The argument was that no matter what she had done, someone has still died, she has family and friends who are grieving, and no matter what we should respect the dead. But not everyone sees it that way. The prospect of high-profile protests being beamed around the world during Wednesday’s funeral has raised concern among some senior Tories. Lord Tebbit, the former Conservative chairman, described the protesters as “mindless bigots” but said that, provided they were obeying the law, the police had no option. He’s right. We don’t have a choice, if it is a peaceful protest then our hands are tied. You cannot arrest people for being ‘peacefully’ disrespectful. What are the chances of everyone being peaceful. The chances are slim as there is always going to be the minority who use it for an excuse to cause issues. The funeral is attracting several protests, pre planned including people turning their backs as the coffin drives by, and no doubt some spontaneous protesters. It appears that there is going to be a small demonstration before the funeral, and then rest bite during the funeral because of the high profile of those attending including the Queen, and they do deserve respect and then a party afterwards. Last Saturday saw a ‘party’ of around 3000 at Trafalgar Square, London. 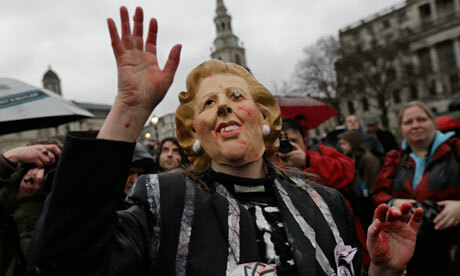 The Met say final judgements about exactly which protests will be allowed will be made on the day, although they have said they do not see their role as enforcing respect for Thatcher’s legacy. That is exactly that – Police are there to protect those who wish to pay their respects and prevent offences being committed by those insistent on causing disorder. We are not making any stand as to who we support – we are impartial – it doesn’t matter who is ‘in charge’, we are a public service to protect and serve the public. I do hope that the Public understand this – we are not supporting her, we are not against her, we are there to protect those who want to show their respects and those who wish to protest against her. Funeral organisers want the public to be able to line the route to pay their respects, but the police acknowledge that this may allow someone to mingle with mourners before attempting to disrupt the procession. The Met said they had a “variety of tactics and powers” at their disposal, adding that they would impose “sterile zones” along on the route where neither the public nor protesters would be permitted. Please can we try and spread the message that regardless of your thoughts and feelings on Margaret Thatcher, if you are going to take to the streets on the day of the funeral, even if you don’t wish to be respectful to MT, then be respectful for those around you. You can still get your message across without causing public disorder. I hope that it goes off peacefully and no one gets injured and that we all get home safely at the end of the day. I think it is summed up by the scum that burgled a Dr banardo shop of all things during a thatcher protest at the weekend. She was a homeless Spanish national not even alive when she was in power. surely the best place for a homeless spaniard is spain, not poncing of the UK welfare system.